I’m a first generation student at UC Davis and I found your name on the First Generation Faculty list. I have some questions about your experience as a first gen student, and how you chose to go to graduate school. I’m interested in your research and would like to talk to you about working your lab. I’m seeking a mentor in the _____ field and was wondering if you would give me some guidance. If you're a first-generation college student, congratulations! Just getting here has required you to push yourself, stretch and grow. You may have a lot of questions and anxieties. There are many resources on campus to help you succeed. 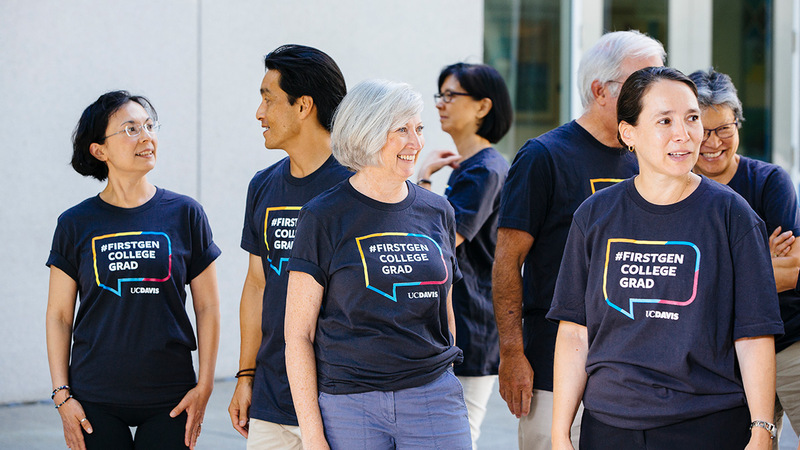 This website was set up to let you know that you're not alone; in fact, many of your professors have faced the challenges of being first-generation students and gone on to become researchers and teachers -- there are nearly 400 first-generation faculty at UC Davis. Their stories and advice are offered as points of connection for you. And what they'll tell you is this: ask questions. Ask for help. Talk to your professors. Visit office hours. Trust your instincts. You don't have to know everything. Participate. Be open to the opportunities you encounter here. First Year Seminars are a great way to get to know your professors and fellow students. This fall, we’re teaming up with FYS to offer seminars by first-generation faculty to help you connect in the classroom. Stay tuned for offerings! In addition to faculty, there are many offices who can contribute to your success. We’re here to help!